Scorched 3D is a modernization of the classic DOS game Scorched Earth "The Mother Of All Games" on which it is based. 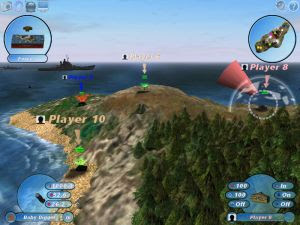 Scorched 3D incorporates a lively three dimensional landscape that includes animated jets, naval vessels, water, and even birds, in addition to detailed tanks and projectiles. Other enhancements include LAN and internet play and music. Scorched 3D is totally free to play and is available for both Microsoft Windows and Unix (Linux, FreeBSD, Mac OS X, Solaris etc.) operating systems.